Book of Shadows are actually journals, notebooks, and other blank paged volumes that are used to record and document all things for your craft. Book of Shadows are one of the most popular and widely used altar tool in witchcraft, wicca, and other practices. Many individuals like to write down all their spells, rituals, and even just daily thoughts within their book of shadows and use it as a journal and spellbook all in one. Being that so much time and effort are put into a book of shadows on a daily basis by the user, they can become quite charged with energy and can become one the most potent tools in an individuals collection. It is also best to have a book of shadows with which you write everything down by hand onto the pages. The reason for this is because the energy directly transfers from the individual, onto the page, and thus into the whole book itself. An important note should be taken when choosing a new book of shadows in favor of the old one. If you placed energy into an old book of shadows then the best course of action would simply be to store it some where in a safe place and wrap it in a dark cloth. This way, the energies within the book of shadows is contained within the book and will not leak out when it is not being used. Dark cloth will contain the energy within the book of shadows. 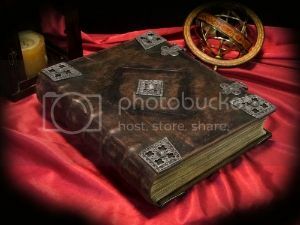 Book of shadows can be made of anything, and many witches, pagans, and wiccans prefer to make a book of shadows from scratch using various materials such as leather, cold cast resin, and cloth with cardboard. Although a blank journal or notebook from the local store will work just fine as a book of shadows as it is the energy put into it that is most important, the sense of accomplishment and energy that can come from making one from scratch would be reward unto itself. Any kind of information can be put into a book of shadows, from rituals and spells to even documenting the moon phases and observing various Neopagan holidays such as Mabon, Yule, or Samhain.